Introduction: To identify pre-operative, intra-operative, and post-operative variables that impact the long term results of laparoscopic Heller myotomy in patients with Achalasia. Methods and Procedures: A retrospective record review and telephone interview with a standardized questionnaire was conducted on 122 consecutive patients who underwent a laparoscopic Heller myotomy from 1995 to 2008. A partial fundoplication was routinely performed. Information regarding re-intervention, residual dysphagia, postoperative reflux symptoms, medication use and satisfaction was obtained. Data are expressed as both means ± SD and median (± range). All variables were compared with the use of paired Student t tests for means and chi squre test for proportions. P values less than .05 were considered statistically significant. Results: A 58% response rate was obtained. The median follow up was 53 months (range, 3-123 months). Ninety five percent of patients were satisfied with the long term results. Sixty four percent of patients had less than one episode per week of residual dysphagia postoperatively, twenty percent reported residual dysphagia up to three times per week, and sixteen percent (11 patients) reported daily postoperative dysphagia. Of those patients who described daily postoperative dysphagia, six patients reported resolution of dysphagia with dietary modifications (small bolus’, thorough chewing, avoidance of red meat and bread) and 5 patients reported daily dysphagia regardless of dietary modifications. Two patients (2.9%) required postoperative balloon dilation. Fifty seven percent (4/7) of patients who were found to have a hiatal hernia at the time of operation described persistent postoperative dysphagia compared to only twelve percent (8/63) for those without a hiatal hernia (p=0.004). Patients who had a BMI of greater than or equal to 30 had more frequent persistent postoperative dysphagia when compared to those with a BMI of less than 30 (mean dysphagia score 2.8 vs 1.8, p=0.025). Four patients had both a hiatal hernia and BMI>30 and all had daily dysphagia postoperatively. Although eleven patients continued to have daily postoperative dysphagia, seven of them were significantly improved from pre-op and were satisfied with the surgery. Forty percent of patients (28/70) were on daily proton pump inhibitors (PPI’s) postoperatively, an additional seventeen percent of patients used antacids intermittently (12/70), and forty three percent did not use any antacids (30/70). Only twenty nine percent (14/48) of patients who had a Toupet fundoplication required routine PPI’s postoperatively compared to fifty nine percent (10/17) for Dor patients (p=0.03). 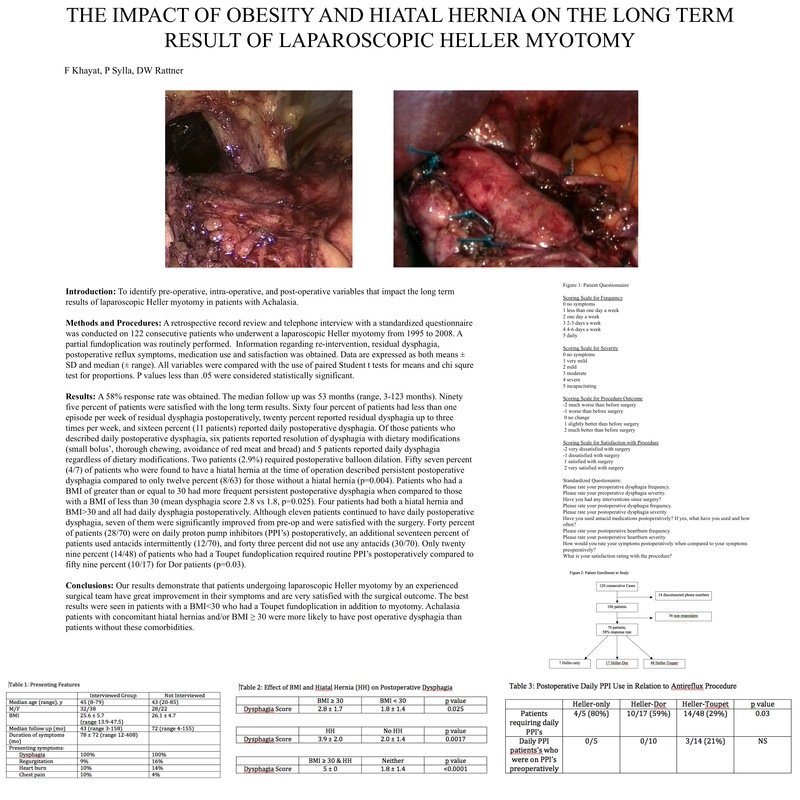 Conclusions: Our results demonstrate that patients undergoing laparoscopic Heller myotomy by an experienced surgical team have great improvement in their symptoms and are very satisfied with the surgical outcome. The best results were seen in patients with a BMI<30 who had a Toupet fundoplication in addition to myotomy. Achalasia patients with concomitant hiatal hernias and/or BMI ≥ 30 were more likely to have post operative dysphagia than patients without these comorbidities.